As exclusive real estate partners to the World Economic Forum - the renowned international institution for public-private cooperation – international property consultancy JLL is an active participant at WEF meetings across the world. Anuj Puri, Chairman & Country Head, JLL India has been a regular delegate at the annual WEF winter meeting in Davos, Switzerland over the past three years. China and India have also hosted WEF meetings since 2000, and the India edition is a highly popular annual event. 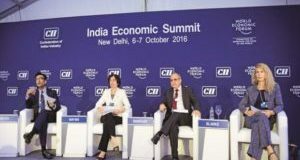 JLL India's top leadership attended the India Economic Summit 2016 on 6-7 October 2016 in New Delhi, and got an inside view of a number of key discussions. Of high interest were the sessions on India's Fourth Industrial Revolution and its dividends, and key debates on how PM Modi's policy reformshave helped revitalized the world's fastest growing large economy. “I attended the World Economic Forum’s India Economic Summit with my eyes trained on discussions by high-level leaders from business, government, civil society and academia that explore how we can collectively shape policies for inclusive growth and harness the Fourth Industrial Revolution. I was richly rewarded on this front. The world economy today is a matrix of divergent growth patterns, where different economies are growing at different paces. The ‘two-speed’ economic growth theory that was followed for at least two decades before the Global Financial Crisis (GFC) of 2008-09 has, over the last five years, given way to divergent growth paths in both the advanced and emerging economies. It has become difficult to cull optimum investment opportunities globally, and BREXIT fears as well as the slowdown in China have further dimmed the global investment outlook. In the words of previous RBI governor Raghuram Rajan, India remained an 'island of calm in a turbulent ocean'. It is for good reason that this South-Asian major not only ranks favourably among all other BRICS’ economies but also with reputed credit rating agencies like S&P, Fitch and Moody’s. China, the much-touted 'growth engine of the world', has been seeing a significant and consistent slowdown in activity. From a peak growth rate of around 14% y-o-y in 2007, it went to an average growth rate of around 9% during and immediately post-GFC. Currently, it is below 7%, and the Chinese economy has become a cause for real concern. In fact, global policymakers, economic analysts and investors waiting to see when and to what extent China will bottom out. China's exports, which accounted for 40% of its pre-crisis GDP, have been under considerable stress as world demand slows down. Mineral ore imports by China have also fallen to adversely impact economies of several developed and developing nations. The export component of its GDP is currently down to one-fourth, comparable to that of India. For consumption-driven economies such as India, falling commodity prices are favourable because their imports get cheaper and trade deficits narrow down. India’s states are comparable to some major economies across the globe. However, the opportunity is way bigger for India as a country and an emerging superpower. Finance minister Arun Jaitley aptly states at the World Economic Forum in Davos earlier this year that India’s GDP can potentially grow to 9%, and that the ‘I’ in BRICS now represents hope for the world. The time is right for India to strengthen its economy and cities further, so that it can gear up for the oncoming Fourth Industrial Revolution. In manufacturing, we need to be innovation-driven as well as mass-product supply-driven under the government's ‘Make in India’ program. The demographic dividend must be capitalized on through other initiatives like ‘Skill India’ and ‘Digital India’, and we must meet the Digital Age heads-on with appropriate skills and talent development.